One thing is for sure, temporary outdoor lighting is a quick and easy way to change the look of your outdoors when you don't have the need for permanent outdoor lighting. You may be looking for a quick way to dress up an outdoor space for your next party, or a quick fix that doesn't need to break the bank. Whatever your needs, temporary lighting can get you the results your after. Lets take a look at the various temporary lighting options available. Often you'll find that outdoor party lighting is the perfect option for your temporary outdoor lighting needs. Thats because outdoor party lighting is meant to be temporary in the first place. You have many options to choose from including battery operated lights, lanterns, string lighting, rope lighting, and table-top lighting. The best part about these temporary lights is that all of the options available make it easy for you to decorate your outdoors. Decorate for your next birthday party or add them to the serene environment of a newly constructed deck or patio. Outdoor string lighting is easy to use decoratively since all you have to do is plug it into a wall outlet and string it along. You'll see outdoor string lighting everywhere around Christmas time but you don't have to be like everyone else, use string lighting anytime of year. Decorative string lighting is often used for lighting an outdoor wedding. The beauty of temporary outdoor lighting is its flexibility. Thats why so many people use them for special events and holidays. Check out all the cool Christmas outdoor lighting ideas you can create for yourself using outdoor string lighting. Its no longer necessary to fuss around with extension cords because battery operated lights make it easy to add outdoor lighting even where you might not think its possible. No more worries about people tripping over the extension cord or having to get on your hands and knees to tape the cord to the floor. Battery operated lights come in many different shapes and sizes. For example, you can find battery operated string lights, table-top lights, and even lanterns. Battery operated outdoor lighting gives you the freedom to decorate without extension cords and prevent your hard work from looking messy and unprofessional. Outdoor rope lighting is a great source of temporary lighting because its so easy to work with. The bulbs are already strung together, evenly spaced, and wrapped nicely in a convenient vinyl tube. All you have to do is decide what color(s) you want and where you want to put them. 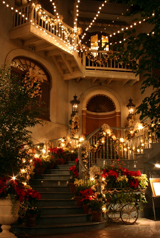 Use rope lights for outdoor path lighting and help guide your guests around your property. Make your outdoor tree lighting more fun by wrapping them with rope lighting. Add rope lights to the underneith of your stairway's risers and use them for outdoor step lighting. You can be as creative as you want and not have to worry because temporary outdoor lighting is just that, temporary. Have fun with it and don't worry because you can always re-arrange it or just take it down.